If you’re still sorting or renovating when the dumpster shows up, it will take you much longer to pack the container, and you could end up running overtime, which will cost money. Break down larger items before the dumpster shows up and be ready to start loading. Have help on hand and keep pets and children out of the way to ensure everyone’s safety. Make sure there is clearance for the truck to drop off and pick up the dumpster. Place the container somewhere you can easily access it for loading without blocking your car or the neighbor's. If time is of the essence, you're probably wondering how to efficiently load a dumpster. It all comes down to the order in which you load your materials. If you have cardboard, insulation and foam, as well as bulky items, place the flattened cardboard, insulation and foam on the bottom, then add in the bulky items after. The weight will flatten the softer materials, buying you more room while also reducing the risk of lighter objects flying from the dumpster when it’s in motion. Then, fit in any smaller items around the bulkier cargo. Try stacking objects into the dumpster instead of throwing them in. This is easier to do if you keep similar items together. For example, if you have tile and flooring you can stack flat, pack it all together by neatly stacking it in the dumpster, where it will take up the least space. Then, fit in odd-shaped items around or on top of the more regularly-shaped debris. You are less likely to cause collapsing piles this way, and you will more evenly distribute the weight, making the cargo safer. You cannot just throw everything into your dumpster and call it a day. If debris is overflowing or is protruding, you’re creating a hazard on the roads. You will also likely be charged an extra fee since the company will need to deal with the additional material to avoid causing a collision. We hope you’ve found these suggestions on how to fill a dumpster useful. 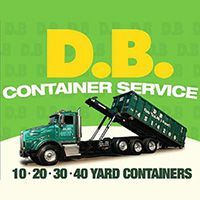 Now that you feel more prepared for that big project, contact DB Container Service for a quote or call us at 718-257-2300 to rent your dumpster. We have all sizes of containers, as well as honest, professional service.